Mobile World Congress 2015 is just around the corner but Huawei has already made a pretty exciting announcement at its event in London – a 4.5G smartband. Claimed as the first LTE-M wearable, the smartband sports an LTE-M chip capable of speeds up to 1Gbps. The LTE-M chip is made by Neul, a start-up company which Huawei acquired last year. Like other smartbands, it will be able to track the user’s fitness levels as well as their heart rate. Besides that, it is touted to have the ability to connect to other Internet of Things (IoT) like thermostats, drones and even enabling virtual reality. The Chinese company mentioned that the 4.5G network provides support of 100K per cell connections using LTE-M, which is 100 times more than 4G. It promises better coverage where it only needs 1/100th of the existing 2G system, requiring minimal signal strength using low-power terminals. The technology is capable of delivering 1Gbps bandwidth on mobile networks and the company aims to make it commercially available next year. 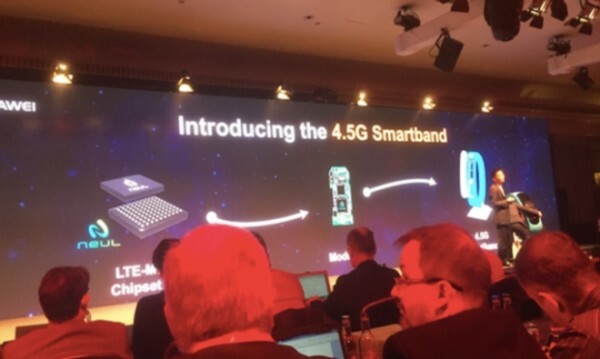 Huawei is staying mum on the looks and specifications of the smartband but if it is anything resemblant of its predecessor, then fans can expect to see a 1.4-inch OLED screen, NFC, Bluetooth connectivity as well as dust and water resistance. It seems like Huawei is leaving whatever’s left unknown of the 4.5G smartband to be unveiled at MWC 2015 in March.